10 or so years ago when I was starting to make swords and buy them I really had no idea what to look for in a sword. Thinking about this recently made me decide it would be a good idea to explain some of the basics to make it simple for beginners who are looking to buy a sword. I will discuss here the basics right through to some of the finer points as I understand them. Stainless steel is great for knives. For swords though it is not so great, unless they are intended for decoration only. Actually it can be dangerous. Once a length of stainless steel gets to about a foot long, or if ground too thin, it becomes weak enough that the amount of force a human can exert upon it will make it prone to breaking. This is because while stainless steel is hard, the hardness comes at the cost of being more brittle. You’ll notice that on alot of knives made of stainless very sturdy ‘grinds’ are used. In other words the steel is left thick in a decent portion of the blade. For instance bowie knives tend to have a long flat surface which is as thick as the stock the knife was ground from, this is to counteract stainless steel’s being prone to breaking if it is too thin. On a sturdy knife stainless steel is perfectly safe, and an excellent choice of material because it is extremely resistant to corrosion. So while a stainless steel sword is great for a display piece, it is unwise to use one to spar with one, and also using them to cut water bottles and tatami mats can result in them breaking. 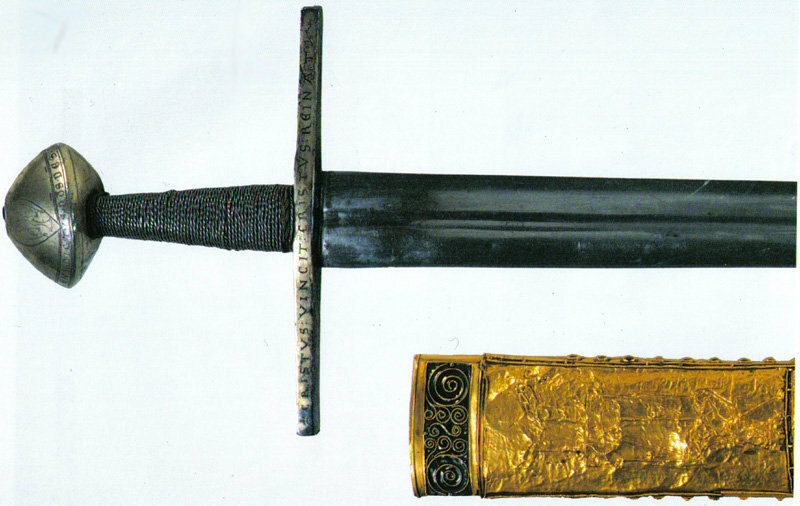 The piece or pieces that come off during the breaking of the sword are very dangerous and have resulted in serious injuries. They are as likely to hit the person wielding them or bystanders. It’s a tautologous term in some ways because steel by definition is a combination of iron and carbon. When the term ‘carbon steel’ is used in regards to a sword though it generally refers to high carbon steel. Mild steel contains 0.3 – 0.6% carbon and is generally not considered an optimal material for knives and swords. This is because it does not harden as well as steels with higher carbon and alloy content, so it is more prone to bending and does not hold an edge as well as high carbon steels. High Carbon steel contains 0.6–0.99% carbon and so will harden better and hold an edge better. In the context of a sword a high carbon sword will flex like a spring when properly heat treated and ground / forged into an appropriate shape. Importantly high carbon steels used for swords also contain a number of other elements that impart a number of qualities to the steel. High Carbon steels for use in swords are often referred to by their American Iron and Steel Institute (AISI) designations, for instance 1060 contains 0.6% carbon – 1095 contains 0.95%. Outside of the sword world these steels are frequently used for things like Industrial Guillotines. Two other elements worth mentioning (though there are also many others but time and space does not permit a full discussion of all of them here)are Maganese and Silicon. Maganese increases hardenability, as does copper – copper also imparts a modest amount of corrosion resistance (minor compared to stainless steel however). These elements will both be found in High Carbon Steels. Silicon, found in many spring steels imparts springiness. Spring Steels are high carbon steels but have an extra set of qualities. Some people prefer them. The afforementioned 10 series steels are technically spring steels, but have a lower silicon content than steels from the 5, 6 and 9 series (for instance 5160). Some makers prefer the latter, others the former. All of them are great, it comes down to a matter of taste, suitability for the type of sword and so on. In the world of industry these spring steels are often used in automotive springs. Tool Steel generally places accent on Vanadium content. Vanadium imparts steel with shock resistant qualities, so the steel may be in some ways ‘softer’ though this would hardly be noticeable except in laboratory conditions, but can withstand more shock without developing stress fractures. Tool steel is frequently used in, you guessed it, tools! Tool steels have names like O1, L2, L6 and so on. All of the above specialities steels with the exception of mild are perfectly suitable for a sword, and none of them are superior to each other, they just have different uses, and slightly different qualities. If you are interested in learning more about steels, Wikipedia represents an excellent and free starting point. I’ve made a summary above in my own words, but if you are serious about acquiring a deep technical understanding of steel sources like Wikipedia, and technical manuals will always be superior to abbreviated summaries. I could write alot about distal taper, and alot has been written. Rather than slow the narrative down though I will explain the basics and let you do your own thinking about it, because you will find with regards to distal taper that everyone has an opinion, but that no one has all the answers. Distal taper is taper of the sword’s thickness. In general this will result in a sword that is thinner at the point and thicker at the base. 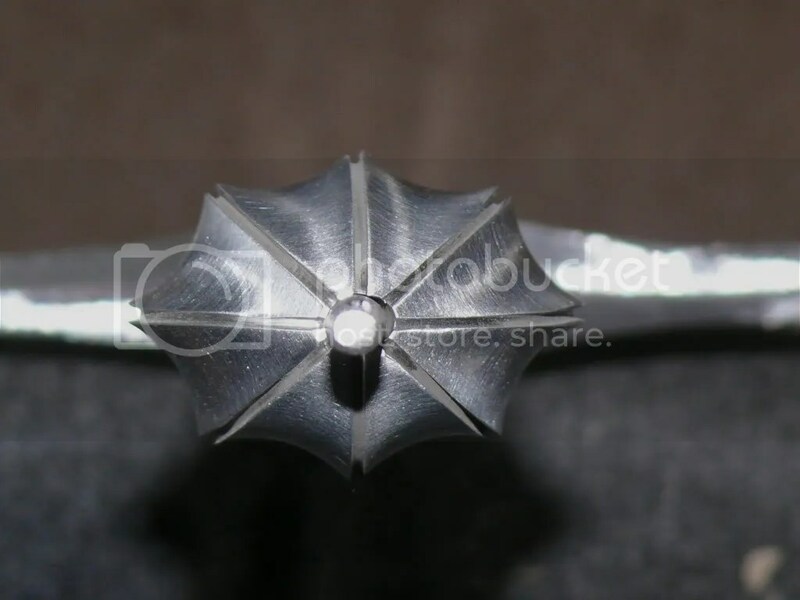 What this does is help the sword’s balance in the hand, and affects the way the sword will flex. Some swords have lots, others have none. A sword without any can work just fine, in fact some swords suit having none. It is really up to you how important distal taper is to you on a particular sword, so don’t believe anyone who tries to convince you they have the be all and end all answers on distal taper, often it is a matter of taste and suitability. Heat treatment is how steel has been ‘cooked’. Steel will come from the steel factory in an unhardened state, and then can be hardened according to needs by the end user. What this entails in the context of a sword is heating the sword until it is so hot is no longer magnetic (about 1200 c) – it will be about a red colour. It is then ‘quenched’ which means it is rapidly cooled by immersion in liquid. For swords the quenching medium is usually oil. This hardens the steel. The steel is reheated to about 400 c and then either quenched again or allowed to cool in the air. This makes the steel springy. The end result is steel that is hard and springy, not brittle. This is a term that refers to the shape of the cutting edge of a sword. Most modern knives have a bevel and then a secondary bevel which is the part that does the cutting. 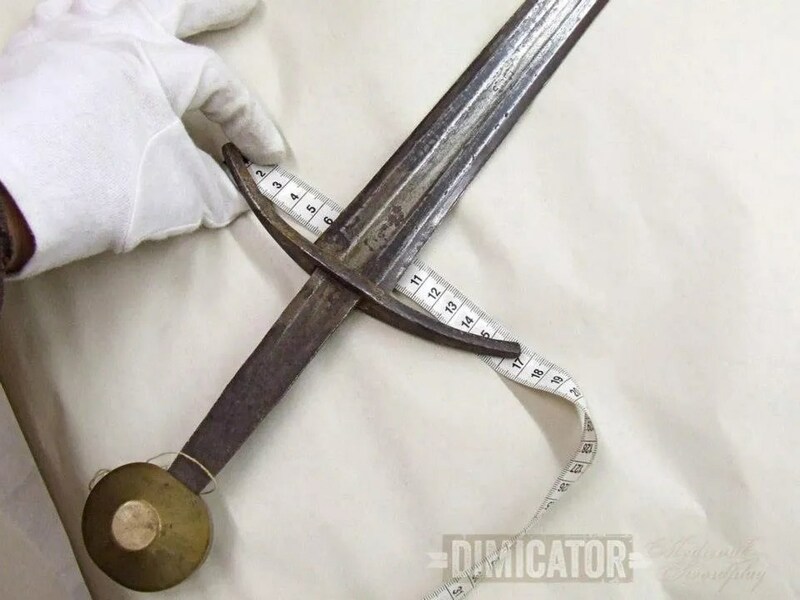 Alot of historical swords had the same type of edge geometry. Others had a smoother transition and this is often called ‘appleseed’ geometry. It is a bit like a parabolic curve. Neither is superior. Both will cut fine. It is a matter of choice and taste which you prefer. 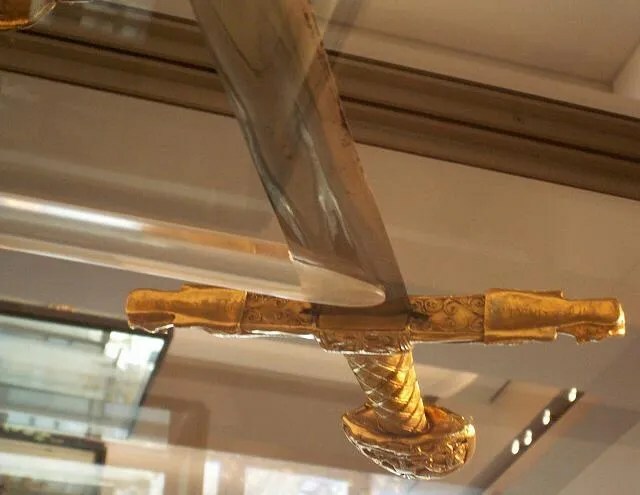 Alot of historic swords had hilts which were ultimately held in place by burnishing the end of the steel that came through the centre of the handle and through the pommel (the piece of metal at the very end of the hilt). Peening is still used today. 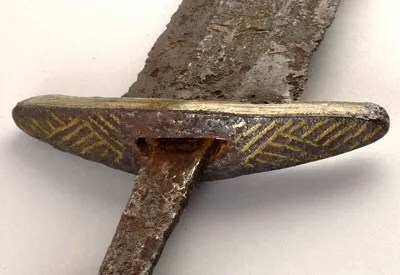 Other methods of holding a hilt together include riveting the grip to the tang (the tang is the metal underneath the handle / grip which is connected to the rest of the sword). This was also done historically. Yet another way of holding a hilt together is with a nut at the end of the tang, which allows for the sword to be relatively easily disassembled. This method came into use around the 16th century and so is also a historically represented technique. All three of the above methods will hold a sword together just fine, and again it is a matter of taste which you prefer. Another method which is found occasionally is where the pommel is screwed on to the tang. 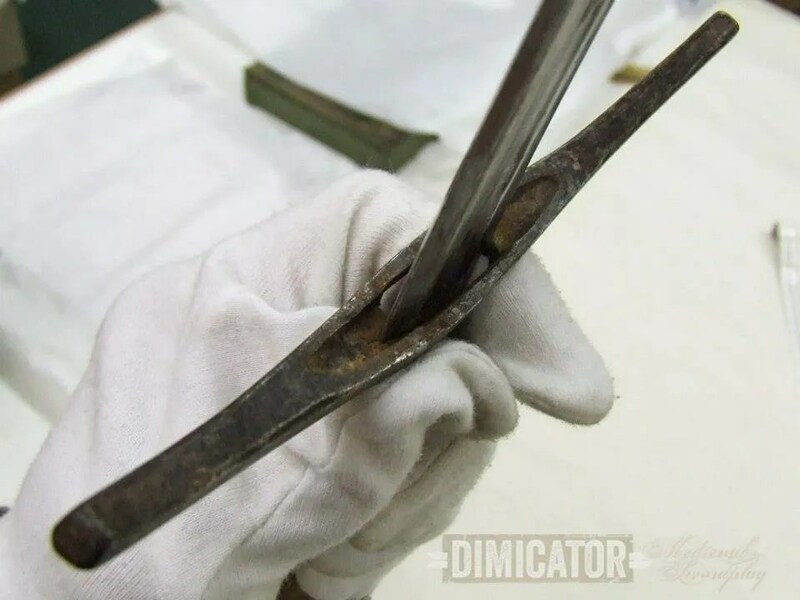 This method can hold a sword together tightly but is not as popular as the above method, because unless the pommel is also affixed with epoxy resin, this method can be prone to rattling and coming loose unintentionally. If done properly though it can be a perfectly acceptable way to secure a hilt. IS A FORGED SWORD BETTER THAN A SWORD MADE FROM STOCK REMOVAL? This one comes up quite a bit. In short it is a matter or taste. In the past it was necessary that all swords were forged – steel had to be refined in this way to make it suitable for use as a sword. Nowdays the steel comes out of the Steel Mill so pure that forging is optional, and results seem to indicate that it does not produce superior swords but rather ones of equal quality. Often you will find that sword makers tend to forge a sword either to create an interesting effect in the metal like pattern welding (where two or more types of steel are forged together then etched, the different reactions the two steels make to the acid producing a pattern); or the steel is forged so that a shape that is not otherwise practicably achievable – like the curve in a scimitar. This is an area that is very controversial in swords. Ultimately the controversy is due to huge variances in personal taste. For this reason I believe it is preferable for people to make their own minds up, try different types, and see what they prefer. You will find issues discussed like nodes (where a sword vibrates when the blade is struck), point of balance (where the sword balances when held on one finger like a see saw), pivot points (the axis around where a sword pivots when swung) and many others. It is up to you what is important – if they interest you learn about them, if not do not worry. Myself personally, while I have spent a long time learning about them, I prefer to judge a sword by how it feels overall and whether it suits my tastes. You may find that you like analysing statistics and data before making a choice. There is no perfect answer, it really is up to you. I hope you have enjoyed this brief introduction to the world of swords! Rather than drawing acute conclusion I have attempted to present the basics in an open way. Do not let anyone close your mind about swords, or try to convince you that they have all the answers. You will find the people who attempt to do that never know as much as they claim to, and either have a financial or ego driven stake in trying to convince you that they know everything. Keep your mind open. I have learnt a great deal about steel from professional metal workers like welders and fabricators. I wouldn’t have been able to learn the incredible things they have taught me if I strutted around as a sword maker pretending I knew everything. Welcome to the world of swords and enjoy the ride! A fine sabre from Alae Swords cleaned and oiled to perfection. Demystifying sword care is a difficult thing on the internet, but sword blade care it is a basic and straight forward task if you know how. Firstly carbon steel swords are subject to corrosion. This can happen because of finger oils on the blade, humidity in the air and time, but with a little effort you can forestall this corrosion (rusting) with ease. This is a simple task so I will make this article brief. There is no magic formula. Don’t touch the blade, or if you do remove your fingerprints with denatured alcohol (methylated spirits) and then apply a thin even coating of mineral oil (baby oil). Methylated spirits / denatured alcohol will strip away any residual oils or substances and leave the blade ready to be oiled. Don’t get alcohol on any paint work or dyed wood because it may affect the colour. It is fine to get on brass and works as a good cleaner. Use a clean cotton rag or tissue to do this process, and a separate one for the oil (if you put them both on using the same applicator the oil will separate and not coat evenly). Provided your scabbard is well oiled using mineral oil, and does not have moisture in it, your blade can be stored in the scabbard almost indefinitely. Ewart Oakeshott frequently attests to this phenomena in his Records of the Medieval Sword. Don’t listen to anyone who tells you not to store your sword in its scabbard as they are wrong. Oil the interior of your scabbard by pouring a liberal amount of mineral into it and then inverting, using a finger or your palm to seal the mouth / throat of the scabbard closed. Invert and repeat until you are sure the mineral oil has evenly coated the scabbard. That’s all there is to it! Follow these procedures and your sword will be trouble free! For the sake of thoroughness oil and or clean it as necessary, or every six months. 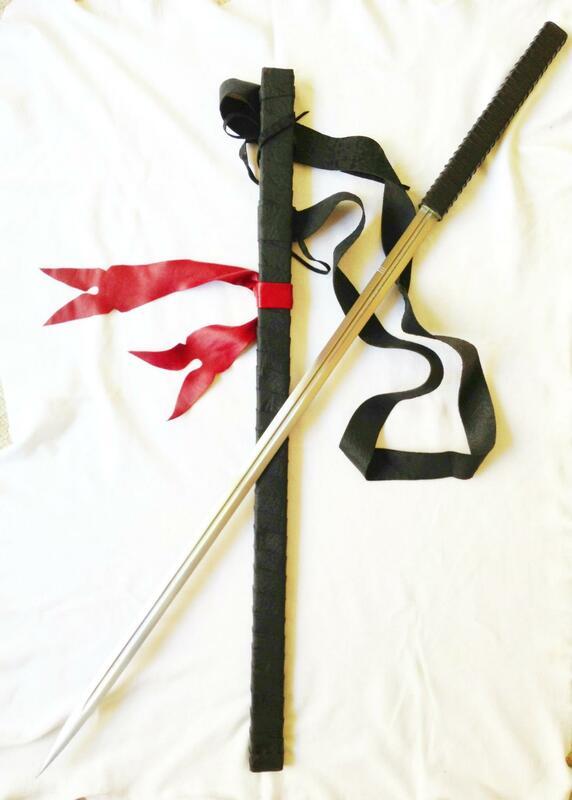 The idea of a scabbard is to keep air off your sword and protect the edges from causing injury when sheathed. I have been caring for a sword and only oiled it every eighteen months and it has been completely corrosion free – the scabbard has been doing its job and I have been thorough in cleaning and oiling it. Ensure for long term storage that you do saturate the lining of your scabbard with mineral oil. Be careful with the sharp edges when you are oiling or cleaning. It only takes a small miscalculation to end up with a cut finger. As a rule lay you fingers flat when cleaning so as the completely avoid the sharp edge, and press very softly on the edges when necessary. A cotton rag will provide more protection to your fingers than a tissue, but both are fine if you go slowly and carefully. Remember with swords – safety always first. A sword can kill quickly and even accidentally. Never unsheath a sword near anyone. Never swing a sword anywhere near any one at all, even if you think a person is a safe distance they can still end up in the morgue if a sword comes loose from your hand when swinging. An accidental stroke can kill someone you didn’t know was behind you. BE CAREFUL.